The winner of the Klaus Flugge Prize 2018 will be announced this evening (7.30pm) at an event in London. The Klaus Flugge Prize is awarded to the most promising and exciting newcomer to children’s picture book illustration. 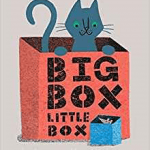 CLPE have produced some notes on teaching ideas for the shortlisted books, which can be accessed on the Klaus Flugge website. The notes aim to illustrate how picture books can be used to enhance critical thinking and develop creative approaches in art and writing. Well, how much fun can a cat have with a box? This book takes a look at this idea. 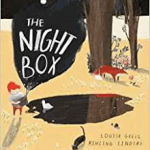 This picture book was also shortlisted for the Teach Primary Book Awards 2018, the Waterstones Children’s Book Prize 2018, the AOI illustration award and it was nominated for the CILIP Kate Greenaway Award 2018. Originally written in Russian, this is the story of a little origami boat that sails along the stream into a wider stream, where it meets numerous different types of boats and has quite an adventure. 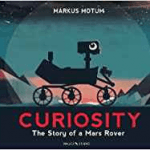 An information book that tells the story of the search for life on Mars, told from the point of view of Curiosity, the Mars Rover. A young boy prepares for the journey he is about to make with his mother. Today is Mindfulness Day and Booktrust have created a lovely list of books to help make children feel calmer and more mindful. Take a look at it here. Tomorrow is Roald Dahl Day. Scottish Booktrust have some learning resources available to mark the occasion. There are also resources available on the Roald Dahl website. Applications are open for schools wishing to take part in judging the winner of the 2019 Blue Peter Book Awards. The application form and more details about taking part are available here. Posted on September 12, 2018 by Laura Brett. 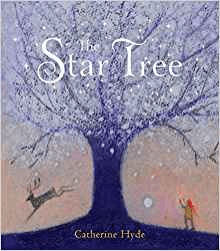 This entry was posted in Book awards and tagged Book Awards, Illustrators, Primary. Bookmark the permalink. 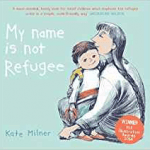 Congratulations to Kate Milner who won the Klaus Flugge Prize yesterday evening for “My Name is Not Refugee”. 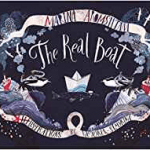 Victoria Semykina was awarded Highly Commended for her illustrations for “The Real Boat”.